It is important to have a good foundation of knowledge about sleep and dreams before starting a lucid dream practice. 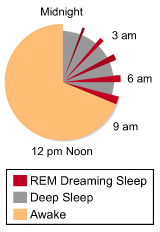 Make sure you understand how the sleep cycle works, and what time of the night most vivid dreams happen. There are 7 things you need to know in order to have a lucid dream. These 7 things are important knowledge that will help you have successful experiences. It is still possible to have spontaneous lucid dreams without knowing these 7 things, but the likelyhood of having the lucid dream go the way you want it to go, or having good clear recall is up to chance. Below are articles about sleep and dreaming.